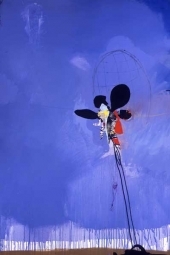 A private collector in the Seattle area recently acquired the iconic�Tethers�triptych by artist TL Lange. The works are now featured prominently in the owner’s incredible lakefront residence where they perfectly complement the home’s modern design and exquisite collection of mid-century treasures. Grand Image artist David Palmer is in the news again. �In a campaign to protect the world's rain forests, Palmer has collaborated with an eco-friendly sandal company�Chipkos�in the creation of the world's most expensive flip flop. If you thought Louboutins and Jimmy Choo's were pricey, how does a one-of-a-kind hand painted pair of�Chipkos, priced at $18,000�sound? �Of course you probably won't ever be able to wear them, but instead you can store them in a mahogany wood and glass display case they come with, and feel good about your contribution to the world's conservation efforts. 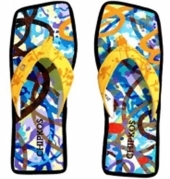 �With the purchase of these sandals, Chipkos will protect 100,000 square feet of endangered rain forest land. On Thursday July 28th, Grand Image and our design neighbors on Ohio Avenue, hosted our 3rd�Annual Modern Design Block Party.�This year we tried something new - we had a local Taco Truck set up shop right out front of GI as well as inside the gallery we offered frozen and “on the rocks” margaritas. I didn’t have a chance to try either, but from the crowds of people out front, and the amount of liquor consumed, I would say both were wildly popular!